New biodegradable cups at Over the Moon Cafe ! 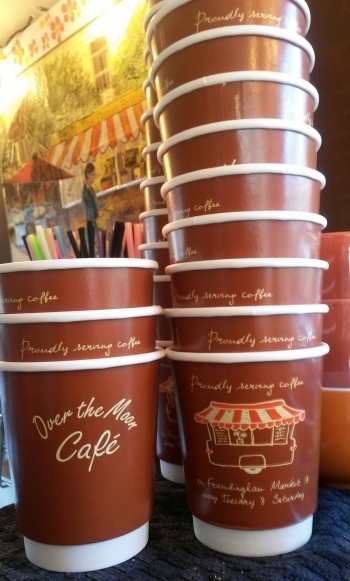 So that big day has finally arrived at Over the Moon Cafe with the arrival of 10,000 new coffee cups ! 10 years of indecision and anticipation – no one can say that this purchase was rash …. 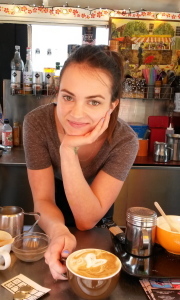 The cartoon image of the coffee wagon on the cups was created with the help of Suzie Vanstiphout , a young artist and graphic designer ( http://cargocollective.com/suzievanstiphout). She spent a few weeks last year working in the van as a barista, and the first planning doodles for the cups started right there . Admittedly her task to create a picture of the van was a million miles away from the abstract art she is used to painting – nevertheless she has most definitely beautifully caught the cutesy and quirky character of our lovely 1940’s ex army coffee wagon . As well as being stunning cups ( well – we think they are ! ) they are also totally compostable and biodegradable . A first for Framlingham possibly ? So yet another reason why we should love our Markets ! Low miles , local products , and low waste ! Oh – and lots and lots of great company with bargains galore ! !